Dating back more than 2 million years ago (between 2.026-2.36 million years ago), the partial skull was found at Malapa, in the Cradle of Humankind World Heritage Site, the same site where the partial skeletons of the new early hominin species, Australopithecus sediba, were discovered in 2010. "Baboons are known to have co-existed with hominins at several fossil localities in East Africa and South Africa and they are sometimes even used as comparative models in human evolution," says Dr Christopher Gilbert (Hunter College, CUNY), lead author of the study. The skull, found during excavations for A. sediba, confirms earlier suggestions that the fossil baboon species to which it belongs, Papio angusticeps, was in fact closely related to modern baboons, and quite possibly the earliest known members of the modern baboon species Papio hamadryas. Modern baboons (genus Papio) are typically divided into a number of populations recognised as either species or subspecies spread all throughout sub-Saharan Africa and into the Arabian Peninsula. Despite their evolutionary success, modern baboon origins in the fossil record have not well-understood or agreed upon. "According to molecular clock studies, baboons are estimated to have diverged from their closest relatives by ~1.8 to 2.2 million years ago; however, until now, most fossil specimens known within this time range have been either too fragmentary to be definitive or too primitive to be confirmed as members of the living species Papio hamadryas," says Gilbert. "The specimen from Malapa and our current analyses help to confirm the suggestion of previous researchers that P. angusticeps may, in fact, be an early population of P. hamadryas." Analyses of the specimen at Malapa, and the group of fossil specimens traditionally placed in the fossil species P. angusticeps, suggest that P. angusticeps displays anatomy that is consistent with modern baboon populations. "If you placed a number of P. angusticeps specimens into a modern osteology collection, I don't think you'd be able pick them out as any different from those of modern baboons from East and South Africa," says Gilbert. Furthermore, the estimated age of the specimen from Malapa, ~2.026-2.36 Ma, is in almost perfect agreement with molecular clock analyses for the initial appearance of modern baboons. Thus, the specimen at Malapa may help to solve the evolutionary origins of these highly successful animals and confirm the estimates of molecular studies. In addition, because monkeys are widely recognised as key time-sensitive elements in the fossil record, the fact that the Malapa P. angusticeps specimen is well-dated allows future studies to better estimate the age of fossil sites where the species is found. 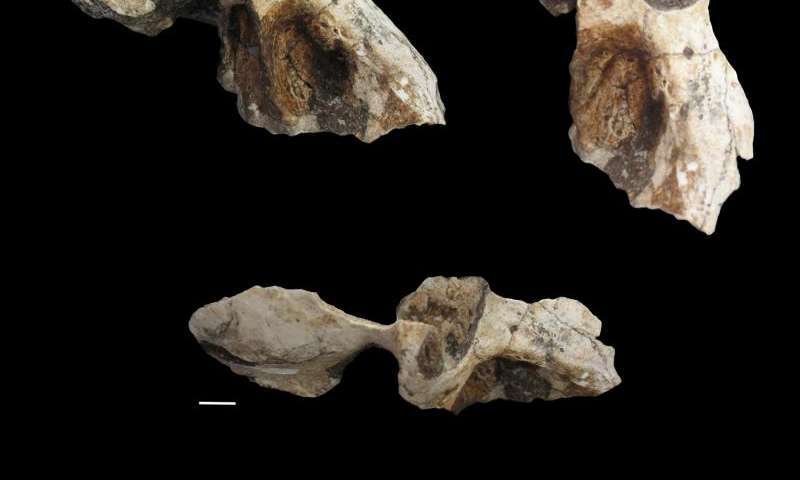 South African early hominin sites, in particular, may be able to achieve more accurate age estimates on the basis of these new findings. 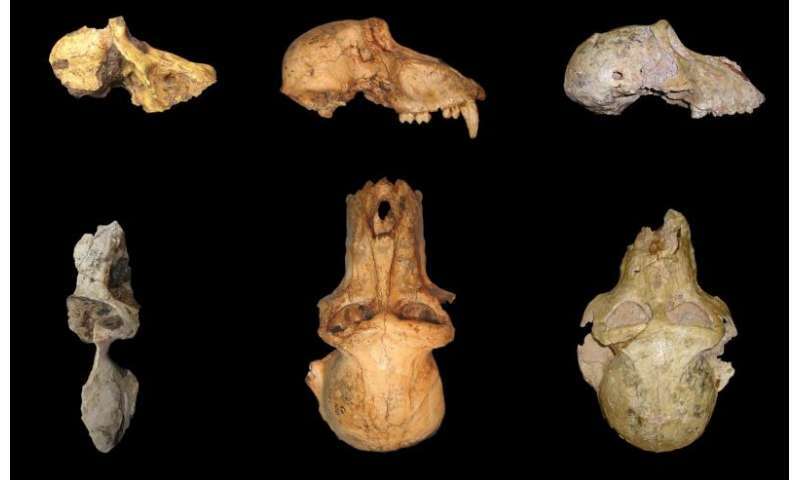 More information: This study is published in an article titled: Papio Cranium from the Hominin-Bearing Site of Malapa: Implications for the Evolution of Modern Baboon Cranial Morphology and South African Plio-Pleistocene Biochronology in the journal, PLOS ONE, on 19 August 2015.